The Texas Supreme Court has reversed the Court of Appeals for the 5th District of Texas in City of Dallas v. TCI West End, Inc. 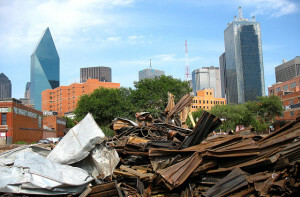 In 2006, TCI demolished the MKT Freight Station located in a Dallas historic overlay district without prior approval, and the City of Dallas sought to pursue civil penalties. The Supreme Court ruled that municipalities may pursue civil action for violating zoning ordinances relating to land use. TCI had argued, and the Court of Appeals held, that cities may only pursue such action if the ordinances related to health and safety. Preservation Texas, Preservation Dallas, Historic Fort Worth, San Antonio Conservation Society, the National Trust and the Texas Municipal League participated as friends of the court. Legal counsel for amici curiae is R. Michael Northrup of Cowles & Thompson, P.C. and Buddy Appe of How Frels Rhode Woods & Duke, P.C. Read the full Supreme Court opinion. Photograph above from the Dallas Observer.